Keep your wee one warm and comfy with this beautifully-crafted Retro Illusion crocheted baby blanket. The colorful design will definitely brighten your sweetie’s space. It also makes for an excellent gift to bring to baby showers! In fact, this pattern is a great project for experienced beginner crocheters looking to create more crocheted baby items to add to their collection. The pattern includes detailed written instructions for one size. 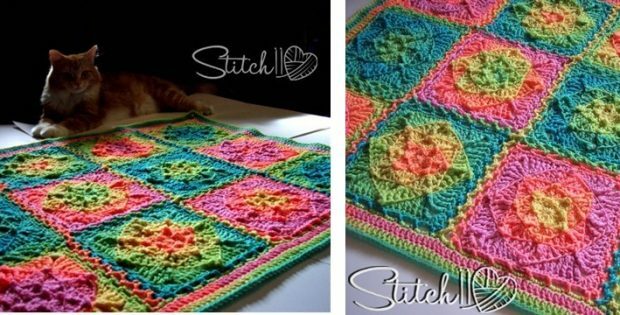 As always, you can tweak the directions or add more squares to make the crocheted baby blanket any size you desire. This crochet pattern is a wonderful design by Corina Gray (Stitch 11). In fact, you can access the FREE pattern for this crocheted baby blanket from her website. Featured image: Stitch 11 – thank you!